Data source: Wells Fargo and Citigroup's quarterly and annual reports. Chart by author. Wells Fargo (NYSE:WFC) has passed Citigroup (NYSE:C) to become the nation's third biggest bank by assets. It's a remarkable accomplishment when you consider that Wells Fargo entered the financial crisis as a regional bank while Citigroup barreled into it as the largest financial institution in America. The realignment vindicates Wells Fargo's simple, prudent, and efficient approach to banking. It earned $5.7 billion in the fourth quarter. JPMorgan Chase (NYSE:JPM), the nation's biggest bank by assets, earned $5.4 billion over the same stretch. That's $300 million less than Wells Fargo even though JPMorgan Chase is 31% bigger than its counterpart on the West Coast. At the same time that Wells Fargo ascended, Citigroup experienced a historic fall from grace. It's hard to pinpoint when the seeds of its descent were planted, but its 1998 merger with Travelers Group was probably the last nail in its coffin, if not the coffin itself. The deal set the stage for universal banks -- those with both investment and commercial banking operations -- to grace American shores for the first time since the Great Depression. The financier behind the move, Sandy Weill, was an empire builder of the first order. He preferred quantity over quality. On top of this, Weill made an incalculable error by forcing out his longtime protégé, Jamie Dimon, in favor of Citigroup's general counsel Charles Prince. By most accounts, the destruction of shareholder value that took place on Prince's watch was motivated by greed and incompetence. He walked away with $99 million in vested stock holdings as well as a pension, in addition to the $53 million in salary and bonuses that he racked up during his four-year tenure at Citigroup's helm. Shareholders in the bank didn't fare as well. Citigroup's stock price is still down 92% compared to its pre-crisis high. It's the type of thing that can only happen in real life -- particularly when juxtaposed against Prince's nine-figure golden parachute. Dimon on the other hand went on to lead Bank One before it was acquired by JPMorgan Chase in 2004; where, a year and a half later, he was promoted to CEO. 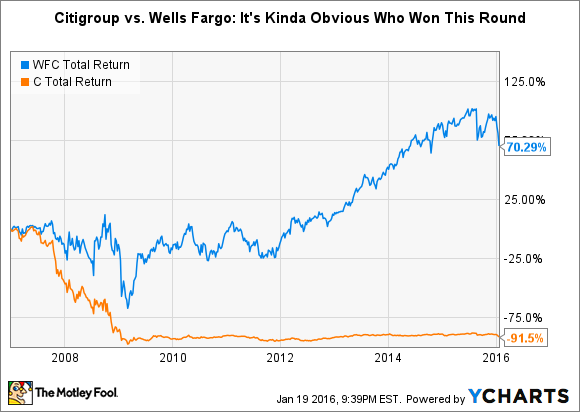 His performance since then, as well as Wells Fargo CEO John Stumpf's, make them among the best in the business. Both of these executive's pre-crisis shareholder letters reveal the temperament and prudence that's needed to run highly leveraged firms that rely on the public's confidence to survive. The Citigroup chief executive told the Financial Times that the party would end at some point but there was so much liquidity it would not be disrupted by the turmoil in the U.S. subprime mortgage market. He denied that Citigroup, one of the biggest providers of finance to private equity deals, was pulling back. "When the music stops, in terms of liquidity, things will be complicated. But as long as the music is playing, you've got to get up and dance. We're still dancing," he said. Chuck Prince may have emerged as a wealthy man -- unjustly so, in my opinion -- but there's no question that his former firm has been eclipsed in almost every respect by JPMorgan Chase and now Wells Fargo. Citigroup may someday claw its way back to the top, as it's done many times before over the past two centuries. But until that happens, investors and American citizens can take comfort in knowing that prudent and conservative banking has won the day -- at least for now.